What was your favorite thing about the home that you grew up in? For me, it was sharing bunk beds with my sister. In the summer, we would hang a long blanket from the top bunk to turn the bottom bunk into a private fort. I don’t remember exactly what we talked about in that bottom bunk, but I remember that we laughed a lot. Homes are precious not just because of the shelter they provide — but because of the memories we create there. When the government takes a person’s home away from them, they are taking away a sanctuary that holds a lifetime of memories. Join the #Homes4All national day of action tomorrow, July 6th to protect tenants from the Republicans’ budget plan. 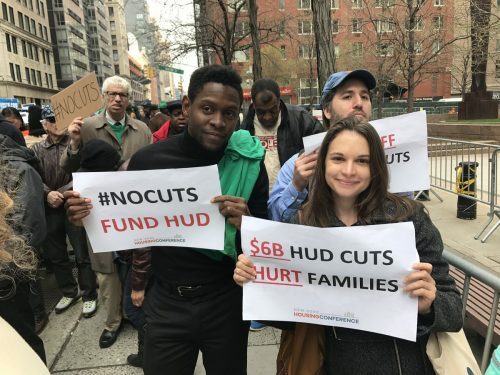 We will be lobbying Kamala Harris to push hard against the $7 billion in cuts to the Housing & Urban Development (HUD) budget, against raising rents on folks who live in public housing, and against the $250K in cuts to section 8 vouchers for low-income tenants. Meet at the UN Plaza fountain at Civic Center at noon. Together we’ll visit Kamala Harris’ office to say #NoHUDcuts. Part of resisting Trump is learning how to show up for each other, especially when some of us can leverage our privilege or power in solidarity with communities targeted by Trump. This Saturday, join a special training for white people who want to deepen and expand their skills as allies and organizers at Resisting Racism: How white people can challenge Trump’s Agenda. RSVP here.